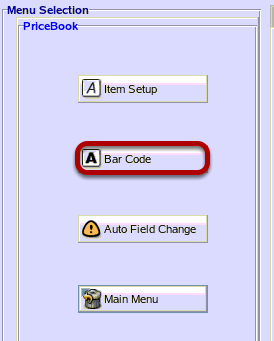 TravStar1 Point Of Sale SystemManager's Work Station Bar Code PrintingHow Do I Print Barcodes? This lesson will teach you how to print a barcode for an item. From the Misc User Menu tab, click on the "Zap Labels"button. The "Zap Labels" button clears out any past or unprinted barcodes. It is recommended that you always run this first. Note: Since this is a custom screen, this button may not be setup. 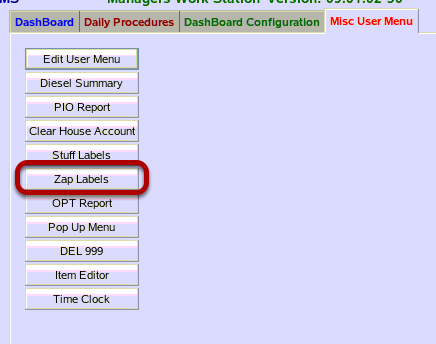 To setup the "Zap Labels" button, please see How Do I Add The Zap Labels Button? 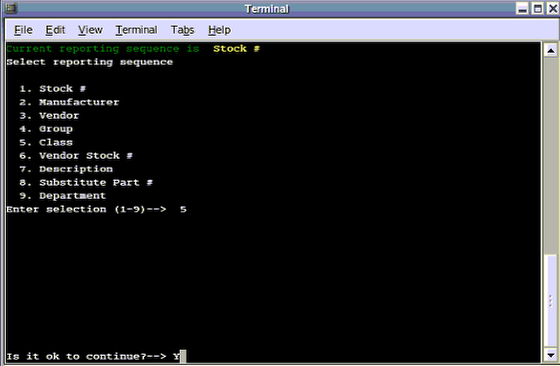 The Terminal screen will pop up and scroll information. This box will close automatically when it is finished. From the Misc User Menu tab, click on the "Stuff Labels"button. Note: Since this is a custom screen, this button may not be setup. 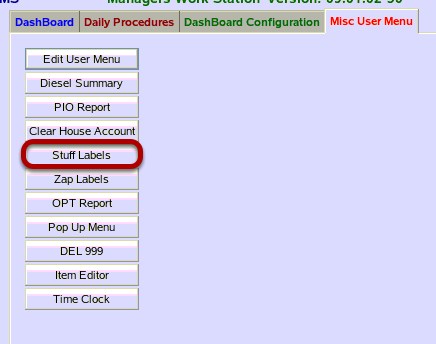 To setup the "Stuff Labels" button, please see How Do I Add The Stuff Labels Button? Type the letter Y then press the enter key. 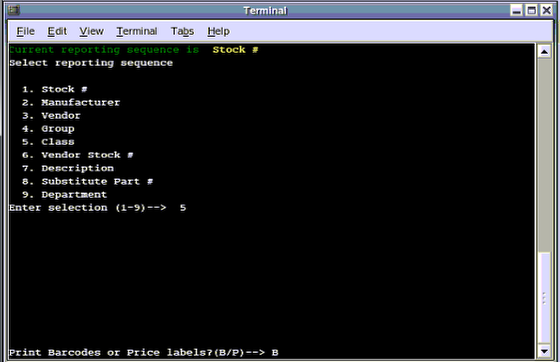 Type a number that matches the sequence you wish to select barcodes by. Then press the enter key. Note: This example uses Class reporting sequence, number 5. 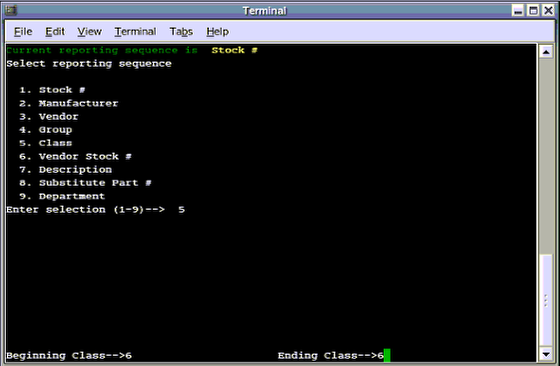 Type a Beginning Class and press enter. 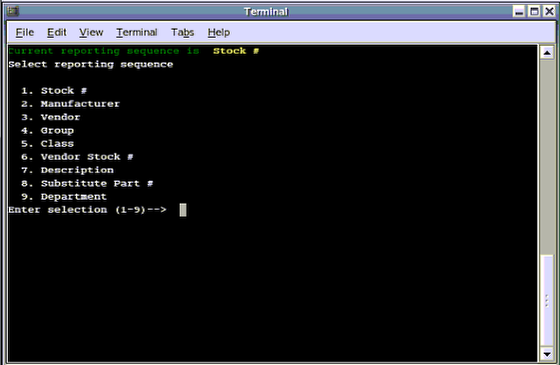 Then type a Ending Class and press enter. Note: These prompts will change depending of the reporting sequence selected. Type in your store number, then press the enter key. Type the letter B, then press the enter key. 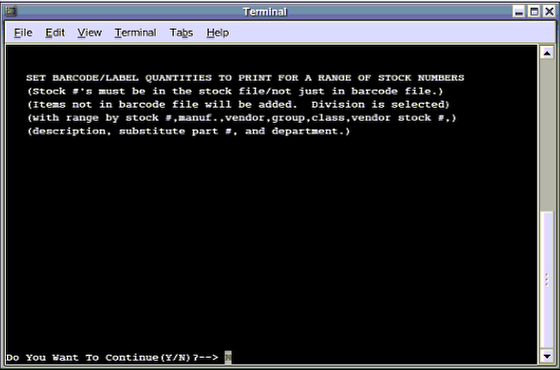 Type the quantity of barcodes you want to print, then press the enter key. Note: If you select to print a quantity of 10, then 10 barcodes for each PLU within the range selected will print. Type the letter Y, and then press the enter key. 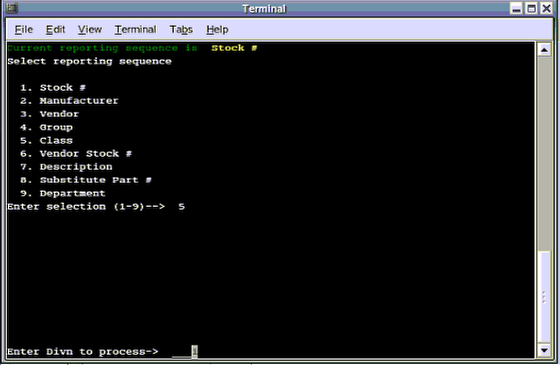 The Terminal screen will close. 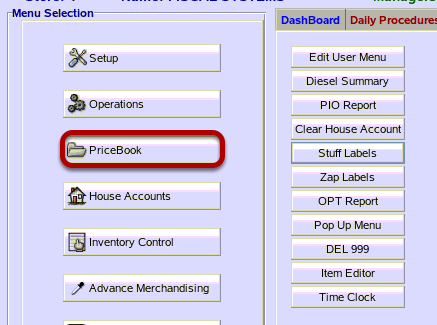 From the PriceBook menu, click on the "Bar Code" button. 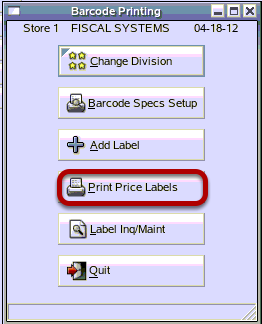 From the Barcode Printing screen, click on the "Print Price Labels" button. Leave the Start Key and End Key blank to print all barcodes. Press the "OK" button on each screen. 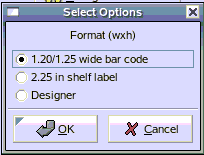 The bubble beside 1.20/1.25 wide bar code will already be filled. Click the "OK" button to continue. The bubble beside 1.00 in. will already be filled in. Click on the "OK" button to continue. Click on the "Yes" button to print the price on the label. Click on the "No"button to not print the price. Type in the device name. Click the "OK" button. Note: If your Barcode printer is setup with a USB port, then the device name will be one of the following: /dev/ttyS0, /dev/ttyS1, or /dev/ttyS2. Please contact Fiscal Support for assistance with the device name. This is what your barcodes will look like when they finish printing. Next: How Do I Add the Zap Labels Button?